The Titan 22 knife series is made with pure titanium. 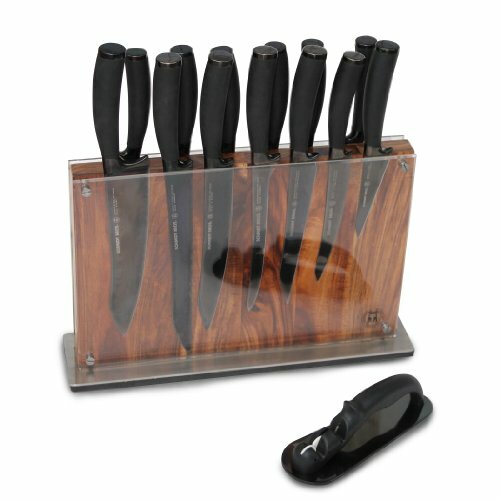 Strong and light weight these knives are ideal for high performace. The high polished Titanium black coating covers the sharp 100% German stainless steel underneath. Soft grip rubber handles are ergonomically designed for your comfort. Each knife features the patented Schmidt Brothers Curve, so your forefinger can guide the blade with greater precision and control. The 15 piece full set includes a 9 inch Bread, 8 inch Chef, 8 inch Slicer, 7 inch Slim Santoku, 7 inch Boning, 6 inch Tomato/Bagel, 4 inch Paratoku, and six 5 inch Steak knives. Also included is a two stage sharpener, and the magnetized universal Downtown Block. If you have any questions about this product by Schmidt Brothers Cutlery, contact us by completing and submitting the form below. If you are looking for a specif part number, please include it with your message.